At Ozark Games our ownership, management, and each staff memeber work hand in hand to produce a great quality product! In 2006 Matt Stahlman began to produce and sell simple prize wheels and marketed them primarily on eBay. Over the course of the next year or so, as the quality of the wheels increased, so did the demand for these games. By the summer of 2007 Matt's father Stanley began to work with him to help fill orders that were being taken on the internet. Again, as their product line grew, so did their sales. By 2009 Matt decided to bring in his brother Josh as a partner. 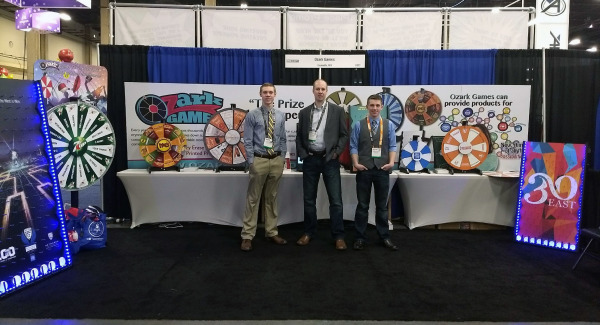 Today Ozark Games is a true family owned and operated business producing thousands of professional products for the advertising industry per year. Ranging from all sorts of custom games and displays, our products are made of high quality lumber with stainless steel hardware. These prize wheels and plinko games are designed to last a lifetime. At last count we stock nearly 100 different combinations of sizes, colors and designs. Our design department can also create a custom game using your colors and company logo. Our state of the art digital printing process creates a product that compares with or exceeds the quality of any promotional items on the market today. This allows us to work with an unlimited amount of colors and design options. After printing, the surface of our prize wheel is laminated with a unique dry erase film which not only provides a durable high gloss finish, but also creates a writing surface for any dry erase marker. Plinko boards are laminated with a great scratch resistant material that will keep them looking sharp through countless events. Custom displays and signs are created using one of our industry leading CNC machines which create high quality, accurate products each time. As a family owned and operated business, we pay attention to each and every detail of the process we use in assembly. Every product undergoes quality control testing and is handled by the ownership of the company. We guarantee the best products offered in our industry can be found right here at Ozark Games. If you are looking for promotional games for your upcoming events, you've come to the right place!